If anti-obesity news coverage has seemed to get a shot in the arm the past few days, you might want to know why. 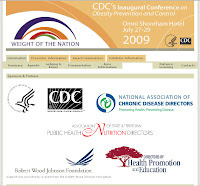 The Centers for Disease Control and Prevention’s Division of Nutrition, Physical Activity, and Obesity has literally given it an injection of media stories, even down to free graphics and banners, with its inaugural obesity conference, Weight of the Nation, held in Washington, D.C. on July 27-29th. The conference, funded by a grant from Robert Wood Johnson Foundation and partnered with preventive wellness, chronic disease councils, and disease management and public health organizations, was announced a couple of months ago, saying its objectives will be to set policies and environmental strategies to overcome barriers to obesity prevention and control in communities, healthcare, schools and workplaces… set specific policy and environmental initiatives impacting obesity; and highlight the use of law-based efforts to prevent and control obesity (e.g., legislation, regulation and policies). The agenda is all politics, not a single examination of the science. Twenty-three states are currently funded through CDC's Nutrition and Physical Activity and Obesity (NPAO) Cooperative Agreement Program which coordinates statewide efforts with multiple partners to address obesity. The program's focus is on policy and environmental change initiatives. These initiatives help support the following behavioral targets: increasing physical activity; the consumption of fruits and vegetables; and breastfeeding initiation, duration, and exclusivity; and decreasing television viewing, the consumption of sugar-sweetened beverages and the consumption of high-calorie/low-nutrient foods. The program seeks to address health disparities and requires a comprehensive state plan. The Common Community Measures for Obesity Prevention Project is a Robert Wood Johnson Foundation program in collaboration with the Kellogg Foundation, Kaiser Permanente and the CDC Foundation. The Healthy Eating Active Living Convergence Partnership, as its website says, “is a collaboration of funders who have come together with the shared goal of changing policies and environments to better achieve the vision of healthy people living in healthy places.” It’s also a partnership of the Robert Wood Johnson Foundation, Kellogg Foundation, Kaiser Permanente, California Endowment and the CDC. Any industry or stakeholder, even the largest drug company in the world, can set up a foundation to lobby for its interests yet those receiving foundation money aren't seen as having any conflicts of interests to report or as having any industry ties. First, in collaboration with partners, CDC will synthesize lessons learned from the conference to identify the challenges to obesity prevention and control, identify setting appropriate policy and environmental strategies to overcome these challenges and determine indicators of progress in implementing these strategies, and then disseminate policy and environmental best practices for obesity prevention and control. Then, CDC will utilize this information to produce its “National Road Map for Obesity Prevention and Control”; guidelines for investing in integrated obesity prevention and control initiatives. Stakeholders are setting national policy. Worse, we’re funding them. Before we take it as a given that science has proven obesity to be a deadly crisis requiring a massive reorder of our society, it’s critical to understand the difference between science and marketing. Few consumers realize that most of what we hear coming from the CDC isn’t from the scientists at the CDC’s National Center for Health Statistics (NCHS), but from CDC’s various marketing divisions. It’s important to understand the difference. It was at this conference, the public first learned that the CDC had been massively restructured to create what its director called, “the new CDC.” It created the National Center for Health Marketing and a second center on public health informatics, as well as four new coordinating centers. “At the new CDC, we are engaging the entire agency in the development of our strategies around obesity,” said Dr.Gerberding. Dr. Edward Sondick, director of the NCHS, said that the bottom line is the NCHS was to be placed within the Coordinating Center for Health Information, along with the National Center for Health Marketing and the National Center for Public Health Informatics. In other words, the NCHS (and its problematic science) was put behind several layers of political firewalls. Thereafter, all communications to the public would come through CDC communications and marketing departments. The CDC directors would have first access to NCHS data before it is released to the public to ensure that the scientific data was released as “actionable” points based on the government’s Healthy People goals. You may also remember that there was a mass exodus of the top CDC scientists during 2004-2006, who were concerned with the honesty and integrity of science and the information reaching the public. By the end of 2006, in addition to more than a dozen leading scientists, all but two of the directors of CDC’s eight primary scientific centers had left. When Dr. Gerberding said that every activity of the CDC would be engaged in its strategies around obesity, she meant it. 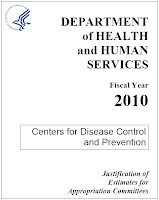 And it continues to be evident today, as in the CDC’s latest budget for fiscal year 2010. Its total $10,101,606,000 budget includes $6,389,000,000 in discretionary spending authority for the CDC and another $1,000,000,000 from the stimulus bill. The changes in this year’s budget reveal its dissolute priorities, such as cuts in Vaccines for Children by $54.1 million, while increasing funding for REACH (Racial and Ethnic Approach to Community Health) by $4 million, and gives $18.54 million more for Health Promotion. ● $7.3 million is for the Behavioral Risk Factor Surveillance System. ● $65.99 million is budgeted for diabetes surveillance, prevention and education (such as its Diabetes Primary Prevention Initiative which is “focused on approaches that identify people with pre-diabetes... to adapt lifestyle behaviors aimed at reducing modiable risk factors for type 2 diabetes” – i.e. obesity). ● $341 million is for cancer prevention and control programs, such as WISEWOMAN (Well-Integrated Screening and Evaluation for Women Across the Nation, which targets low-income women “to improve diet, physical activity, and other lifestyle behaviors to prevent, delay, and control cardiovascular and other chronic diseases”) and NCCCP (National Comprehensive Cancer Control Program, which “provide a blueprint to encourage healthy lifestyles, promote recommended cancer screening guidelines and tests,…[and] education programs about cancers or their associated risk factors”). And there's much more, but you get the idea. As the sampling of links above show, the scientific evidence, often from CDC statistics itself, fails to support any of these programs. That’s why it’s never been more important for us to remember those fallacies of logic and to think and look deeper than the headlines. The speakers at this week’s Weight of the Nation conference came from these extensive partnerships. For example on Monday, Dr. Thomas Frieden, M.D., MPH, alongside the acting Surgeon General, Steven K. Galson, M.D., MPH, and the Senior Vice President of Robert Wood Johnson Foundation, James S. Marks, M.D., MPH, opened the conference. Dr. Frieden’s proposals to tax sugary drinks and salt to prevent obesity and diabetes didn’t have any science behind them when he was New York City’s Health Commissioner and didn’t become any better when he became the new Director of the CDC. Tuesday, HHS Secretary Kathleen Sebelius spoke about moving the CDC’s preventive wellness policies forward and “transform our healthcare system from a sickness system to a wellness system.” If you thought her speech, which was also issued in a press release, sounded like it was written by RWJF, you would be right. All of the oft-repeated, and unsupported, claims about the deadly crisis of obesity were there, with RWJF even cited as the source. The government’s solutions are based on the pop beliefs about the causes of obesity: bad eating and sedentary lifestyles. Not what obesity researchers have long recognized. Before she told audiences “about some of the exciting plans the administration has in this area,” she talked about the children. She cited a list of health problems caused by childhood overweight, according to RWJF, even down to the oft-repeated claim that this might be the first generation to have shorter lives than their parents. “The share of children that are overweight has quadrupled in the last 40 years,” she said. “Type 2 diabetes used to be called ‘adult-onset’ diabetes. Now doctors don't use the term because so many kids are getting it.” This is coming from the leader of the nation’s health agency. But, Secretary Sebelius said “we finally have a plan” to put the nation on a weight loss diet. Thanks to research, she said, “we don’t just have good ideas, we have ideas that are tested and whose success can be measured.” She was right that every proposal she described has been tested — and they’ve all failed to show any effect on reducing obesity over time and improving actual health outcomes. And every independent examination of the evidence has concluded diet and behavioral changes are ineffective. President Obama and I are committed to delivering a health care system that provides all Americans with better quality and lower costs. And fighting obesity is at the heart of both of these goals. That's why the President and the First Lady have made investing in prevention and wellness one of their top priorities. It's why we're going to require health insurance plans to cover preventative services like the kind of counseling and care that can help people lose weight or keep the weight off in the first place. It's why as part of health reform, we'll also be investing in programs like the ones highlighted in the CDC report… President Obama and I don't think this issue can wait. And neither does Congress, which is why they appropriated $1 billion for prevention as part of the American Recovery and Reinvestment Act. Part of this money will go to immunizations and another part will go to prevent patients from getting infections during surgeries and other medical treatments. But most of the money is going towards a prevention initiative that was developed by the CDC and the Office of Public Health and Science with input from many of the groups that are here today. We aren't ready to officially announce this initiative, but we expect that a significant amount of the money will go to help states and communities attack obesity and other public health challenges. This Weight of the Nation summit was carefully staged to correspond to the release of policy papers also funded by RWJF and CDC’s partners. Tuesday afternoon, the Urban Institute hosted a media event called “Ousting Obesity: Strategies from the Tobacco Wars” where it released its policy paper for combating the obesity epidemic. It proposed fat taxes, as Dr. Frieden had, purportedly to reduce consumption of foods they want the public to believe are fattening (based on Britain’s traffic light system that judges the health value of food according to its sugar, fat and salt content). Their policies included other food regulations, such as calorie counts on menus, bans on advertisement and marketing of “fattening food,” and subsidies of fruits and vegetables. The tables and text in the last half of the report revealed what it was really about. They calculated the revenue that state governments could bring in with fat taxes, even after funding fruit and vegetable initiatives to appear to support healthy eating. In some cases, these [CDC] grant proposals (many of which are actually funded) use or misuse statistics, collect data of dubious validity, and even use “legal strategies” to reach social goals and formulate health care policies that the public health researchers believe may achieve “social justice.”… The reader will be surprised to learn that I found probably as many lawyers and social workers as practicing physicians and nurses applying for public health “scientific” research grants! Public health is no longer about people’s health, but about preventive wellness and efforts to change behaviors for the good of society. It redefines medical ethics to mean a collective act of healthism. A leading organization in the government’s preventive wellness movement and promoter of the Healthy People 2010 goals is Partnership for Prevention, funded by RWJF and GlaxoSmithKline, along with Prescription for Health, a five-year initiative funded by RWJF. Frankly, money is being squandered by public health, politicized, pre-conceived research toward collectivist agendas, while the government (and the insurance companies follow suit) keeps cutting reimbursement for the physicians and nurses who are actually ministering care to patients with real, individual medical problems. It's not only a question of squandering money and misallocation of finite health care resources, but also, in the end, a question of population-based ethics versus the reinstitution of the individual-based ethics of Hippocrates. Click here for complete article (and single page version). We can never be allowed to hear good news about our health. The government won’t allow it. “Such is the strength of cultural miserabilism today that even the most smile-inducing good news stories can swiftly be turned into doom-laden tales about the terrible future humanity faces,” wrote Brendan O’Neill, editor of Spiked. Reporting on the latest U.S. Census Bureau report, finding that advances in science, safe food production, healthcare and prosperity have allowed people, worldwide, to live longer, healthier and wealthier lives, Brendan’s article had a much deeper message. It examined our prejudices, our compassion for others and how our society is coming to view the value of human life. His thought-provoking article, titled “Older people are more than food for worms,” was about aging, but could just as easily have been about fat people, handicapped people and everyone deserving of our kindness. It was a reminder of our shared humanness and the need for ethical behavior. 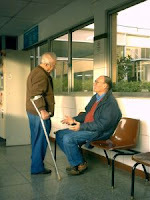 The growth of the older population will have ‘formidable consequences’ and pose ‘widespread challenges’, we were told. 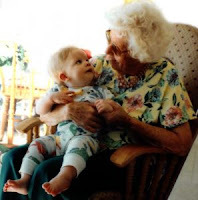 There was talk of an ageing ‘tipping point’, ‘burdens’ on social services, and the need to ‘sound the alarm’ about how the presence on Earth of all these old folks might provoke ‘intergenerational conflict’. In one fell swoop, we went from the revelation that mankind has successfully extended life beyond birth-work-death to warnings of burdensome old people sucking up all of our health and social resources and possibly launching a war of attrition against the young. Nothing better captures the downbeat nature of public life today... The new fear of the old springs from today’s tendency to treat social policy challenges, which an ageing population no doubt is, as insurmountable demographic nightmares – and more fundamentally from our inability to give meaning to human life and see it as something more than a bovine, biological thing. But when we do enjoy longer life expectancies, suddenly success is treated as a sign of doom and older people as little more than burdens. Our fetishisation of youth is a way of erecting a barrier against the future, keeping everything in an innocent childish state in order to avoid having a grown-up debate about our potentially grown-up futures. Today’s ambivalent or outright hostile attitude towards the ageing process really reveals our inability to give meaning to human existence today. Rather than seeing older people as an integral part of some social fabric… we see them as a drain on society’s apparently limited resources. Rather than seeing older people as individuals with hopes and aspirations like the rest of us, we see them increasingly as little more than bovine creatures with a long list of burdensome medical needs. Many now ask: ‘Who wants to live to be old when you’ll only be sick and slow and incapacitated?’ – revealing our inability to see the profounder side to life behind any health problems individuals might have to endure. “Quality of life” as seen through the eyes of a youth-oriented society does not mean the lives of older people are any less meaningful. When older lives are no longer valued by society, at what age do they become “too old” to get medical care and use public healthcare resources that could go to healthier, younger people? That happened in Sweden’s government-managed healthcare, but could never happen here… could it? Readers deserve to know about Dr. Ezekiel Emanuel, M.D., Ph.D., who serves as the director of the Clinical Bioethics Department at the U.S. National Institutes of Health. He's a key creator of Obama’s healthcare reform plan and his bioethics advisor. He’s also the brother of White House Chief of Staff Rahm Emanuel. First, there is the matter of physician culture. Medical school education and postgraduate training emphasize thoroughness. When evaluating a patient, students, interns, and residents are trained to identify and praised for and graded on enumerating all possible diagnoses and tests that would confirm or exclude them… In medical training, meticulousness, not effectiveness, is rewarded. Specifically, how medical care is planned to be allocated (rationed) in the United States was described in the January 31st issue of the journal Lancet in “Principles for allocation of scarce medical interventions” by Dr. Emanuel and colleagues. In making rationing decisions, they recommend an alternative triage system they called “the complete lives system, which prioritizes younger people who have not yet lived a complete life.” Their ‘complete life’ principle also purportedly includes prognosis, lottery and instrumental value principles. Preferential allocation of a scarce liver to an acutely ill person unjustly ignores a currently healthier person with progressive liver disease, who might be worse off when he or she later suffers liver failure… [However], when interventions are persistently scarce, saving the progressively ill person later will always involve depriving others. 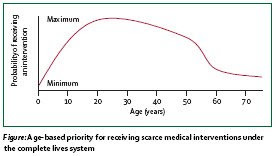 When implemented, the complete lives system produces a priority curve on which individuals aged between roughly 15 and 40 years get the most substantial chance, whereas the youngest and oldest people get chances that are attenuated… the complete lives system justifies preference to younger people… Age can be established quickly and accurately from identity documents. The government, our government, is already working on deciding what lives are more valuable based on their usefulness and burden on the state, how long we will be allowed to live, and which of us will die. [W]e are dealing with human beings, our fellow human beings, our brothers and sisters. With poor people, sick people, if you like unproductive people. But have they for that reason forfeited the right to life? Have you, have I the right to live only so long as we are productive, so long as we are recognized by others as productive? ... then woe betide us all when we become old and frail!... then woe betide the invalids who have used up, sacrificed and lost their health and strength in the productive process… then woe betide loyal soldiers who return to the homeland seriously disabled, as cripples, as invalids. If it is once accepted that people have the right to kill 'unproductive' fellow humans—and even if initially it only affects the poor defenseless mentally ill—then as a matter of principle murder is permitted for all unproductive people, in other words for the incurably sick, the people who have become invalids through labor and war, for us all when we become old, frail and therefore unproductive. Then, it is only necessary for some secret edict to order that the method developed for the mentally ill should be extended to other 'unproductive' people, that it should be applied to those suffering from incurable lung disease, to the elderly who are frail or invalids, to the severely disabled soldiers. Then none of our lives will be safe any more. Some commission can put us on the list of the 'unproductive,' who in their opinion have become worthless life. And no police force will protect us and no court will investigate our murder and give the murderer the punishment he deserves. Who will be able to trust his doctor any more? He may report his patient as 'unproductive' and receive instructions to kill him. It is impossible to imagine the degree of moral depravity, of general mistrust that would then spread even through families if this dreadful doctrine is tolerated, accepted and followed. * That’s also why, in part, it was important to understand economics and the facts of who the uninsured really are in this country. Instead of finding a way to help the 7% of Americans who actually need our help and rather than caring for seniors at the time in their lives when they most need medical care, healthcare reform will have taxpayers pay for managed care for 18 million generally healthy young adults, 9.5 million illegal aliens, and 17 million with incomes over $50,000. As hard as some are trying to make healthcare reform to be about political sides, it is really about human lives. Sadly, because the general public largely doesn’t understand what healthcare reform is really about, the very people who are most likely to be harmed by it — older, fat, disabled, poor and the most vulnerable — are the ones being most led to believe that it’s about taking care of them. Even sadder, experienced medical professionals have seen where we’re being led for well over a decade, but the information hasn’t reached patients and people. The debate, especially the one in the media, is centered on emotional, intuitively-correct arguments and anecdotes, rather than careful examinations deeper than the headlines to understand the facts, economics, history, medical evidence and, most of all, the ethics of the issue. It’s uncomfortable and hard to think about things that are unpopular to question, including our own beliefs. 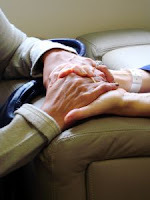 As difficult as it is to contemplate, the emotional perspectives on healthcare reform are largely driven by whether one thinks individuals are basically good, caring people who try to do the right thing and will help those in need, or if one thinks everyone is looking out for themselves and what’s in it for them. The ethical questions come in when those looking at what’s in it for themselves try to convince themselves and others that they are acting more ethically. “Evil acts can be given an aura of moral legitimacy by noble-sounding… expressions,” wrote Walter E. Williams last November when he explained the difference between laudable charitable acts done by caring people to help their neighbors versus forcible use of one person to serve the purposes of another. The second perspective in this debate comes from whether one thinks individuals are too dumb and irresponsible to decide what’s best for themselves, to choose their own doctors and make their own lifestyle choices, and that doctors are incapable of making sound clinical judgments or do their jobs — or if you believe that you have the right to decide what’s best for someone else; to make others pay for and comply with treatments, diets and lifestyles you believe are best for the common good; to prevent other people from seeing the doctors or seeking the care they want; and to mandate the care doctors must provide. The ethical questions come in when those looking to take away the choices and control the actions of other people, including doctors, try to convince themselves and us that what they want is not only right, but a right. Taking our information from mainstream media and social marketing venues can lead us to believe that those voices we most hear also represent what most people think, including most doctors and medical professionals. Over the past fifteen years, increasingly what we hear from media and spokespersons leads us to believe there’s a new medical ethics that is displacing our doctors' Hippocratic Oath to do what’s best for patients and replaced it with a duty to act foremost for the common good and based on costs to society. But are most of the doctors and nurses — the ones caring for you and me — really embracing the new medical ethics? What do our doctors and medical professionals think? When we are sick and entrust a doctor with our lives, most of us want to feel we can trust that the care we are receiving is based on our doctor’s years of experience and clinical judgment, that medical ethics and the personal and private relationship we have with our doctor are guiding our doctor to do what he/she believes will be best for us, and that our care is in accordance with our own choices. It’s a terribly frightening thought for most people that, instead, the medical marketplace and its bottom line is calling the shots and that our doctor could be being forced to answer to a growing hoard of government regulators; politicians; lawyers; policy makers; pharmaceutical, healthcare industry and insurance companies; and oversight agencies. Before we let the media scare us into believing that most doctors are following this new medical ethic and no longer care most what’s best for us. Before we let the media scare us into believing that most doctors are so incompetent and corrupt they need governmental oversight and mandated clinical guidelines in order to provide safe, ‘quality’ care. Before we let the media convince us that only a few uncaring, uninformed people with political motives are opposing healthcare reform… We should listen. The voices rarely heard in mainstream media are those of the medical professionals who are providing the hands-on care we receive. The general public doesn’t realize that what experienced doctors and nurses have been discussing for years is far different from what we hear from doctors on TV and in academia. It turns out that most doctors do care, very much, for their patients and they have not abandoned the medical ethics that brought them to medicine. Their opposition to third-party managed care is because it violates the most fundamental medical ethics. Sermo is the world’s largest online medical community with more than 100,000 registered licensed physicians in 68 specialties and in all 50 states who collaborate on difficult cases, share clinical research and work towards better patient outcomes. It has been active since 2006. This past week, it released the results of a survey of a nearly 10,000 doctors representative of the U.S. physician population in regional distribution, urban and rural locations, age and nearly all specialties. These doctors were all verified to have valid, active licenses to practice medicine in the United States, with a median 25 years of practice experience. It reported that 94% of the physicians do not endorse the healthcare reform bill in the House [which is soon to be melded with the Senate’s similar version] or government managed care. Not one of the healthcare issues cited by practicing doctors as being most important were addressed in the legislation. 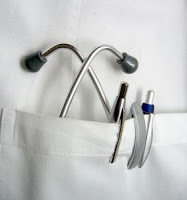 In fact, practicing physicians believe it reinforces and will worsen what they described as the “insurance industry’s undue authority and oppressive control over healthcare,” the “excessive and misguided government administrative costs” and regulations that require doctors to spend more time on documentation than with their patients, while giving non-medical professionals oversight and decision-making authority over the care they can provide. Nor do most practicing physicians support the American Medical Association’s recent endorsement of such healthcare reform. For years, opposition to the American Medical Association (which has been steadily moving towards promotion of those new medical ethics) has grown among doctors and the AMA’s membership is now estimated at only 15-20% of doctors. As the CEO of Sermo said of the healthcare reform legislation, it perpetuates the AMA’s core revenue streams and puts its own financial interests ahead of doctors and patients. [O]ur healthcare system has lost focus to the point where patient well-being is placed after politics, profits and special interests. Healthcare costs are on the rise and patients have lost their freedom of choice. These trends are hurting our economy and compromising the doctor-patient relationship. As a result, it has become difficult for physicians to deliver the best possible care... You are paying a lot for healthcare and not receiving enough in return. Your insurance premiums continue to increase while your healthcare options are dwindling. Gatekeepers, insurance networks and restrictive regulations limit your choice of doctors and your access to care. You have been made dependent on complicated and expensive health insurance plans. Employers are forced to take money out of your paycheck to purchase health coverage. If you lose your job, you are left with no safety net and the money you have paid for health coverage vanishes. The time you spend with your physician has become remarkably brief due to regulatory hurdles requiring doctors to spend more time on documentation than with you. This isn’t about politics. This is about the ethics of forcing medical professionals to do what third party payers— government Medicare, Medicaid and private insurers — order. With the medical home model that’s been under planning for years, electronic medical records and pay-for-performance measures will give the government, insurance, pharmaceutical and medical industry unprecedented surveillance, control and oversight over patient care, leaving doctors unable to provide the care they feel best and patients unable to have a choice. Most medical professionals recognize that many of the clinical guidelines, regulations and performance measures they will be compelled to follow are, as covered at JFS for years, not based on sound science, have not been shown to improve health outcomes for patients, and will harm large numbers of patients — most especially those who are aging, fat and socioeconomically disadvantaged. Under nationalized managed care, those with bad numbers (health indices that the evidence shows are not measures of health or risks of chronic disease or premature death, but of age, size, heredity and social-economic status) or special needs will be targeted as costing society too much. We've already seen the "costs" of obesity and chronic disease of aging used to support all manner of public policies, interventions and surveillance. Those not seen as complying with prescribed diets, lifestyles, exercise regimens, screening tests, weight loss, counseling and taking medications will be blamed for failing to take responsibility to stay healthy and, therefore, undeserving of care when they get sick. We've already seen these beliefs in preventive wellness widely circulated, too. This has become serious really fast. We can no longer afford to just worry about trivial things like if someone thinks we look too fat. We’ve already examined the concerns of medical professionals with managed care, as well as the proposed rationing of care based on comparative effectiveness that target those who are older, fat, disabled and the most vulnerable in need of care. The unthinkable consequences are closer than we might want to even think about. You’d have to live under a rock, too, to not know that Obama’s Science Czar has proposed some of the most unconscionable acts of eugenics, based on radically unsound beliefs, and his appointment sent shock waves through the scientific community that understands the science surrounding population control. But never before in the history of our country, have we been this close to making federal law that formalizes withholding of care to certain groups of people. Sure, there are some bad doctors out there who are incompetent or follow greed rather than creed, and others who are guilty of looking the other way. But it’s reassuring that medical ethics is not dead and so many doctors have been trying to speak out, even at risk to their careers. Most doctors and nurses made medicine their vocation because they care about people and love helping people, and still do. What ethical oath have government appointees, politicians and corporate executives pledged? Do those who are leading seniors, fat people or minorities to support managed care, healthy lifestyles and medicalization — whose script is right out of the pages of Nazi healthism — realize that they are really working to advance the agendas of the pharmaceutical, medical supply and insurance industries and their government agency partners? Do they understand what they are supporting? But the most important person in government overseeing healthcare reform, is Nancy-Ann Min DeParle, who President Obama appointed as director of the White House Office of Health Care Reform in March. Also known as the Healthcare Reform Czar, this position is above Cabinet-level and answers only to the President and has been given the authority to make or influence decisions for Cabinet-level agencies. 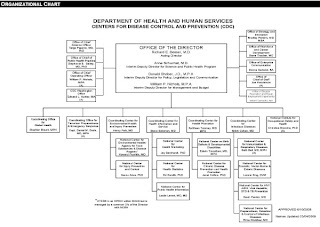 The Healthcare Reform Czar position, as readers may remember, was originally slated to go to Tom Daschle in addition to serving as Secretary of Health and Human Services, until his vast conflicts of interests came out during the Senate confirmation hearings for Secretary of the HHS and put him out of the picture. In his place, Ms DeParle was quietly appointed the Healthcare Reform Czar, which is not subject to Senate confirmation. It is doubtful that the general public knows much, if anything, about the person behind healthcare reform. Ms DeParle holds a law degree from Harvard Law School, not a medical degree, according to whitehouse.gov — which provides few details on the corporate boards she’s served on, saying only that she “brings a unique industry perspective from her work in the private sector.” Most of her positions have been administering and serving on the boards of major medical companies. Shortly after her Czar appointment, she stepped down from the corporate boards of Cerner, Medco Health Solutions (a pharmacy benefit manager), Boston Scientific (medical devices manufacturer), CareMore Health Plan and Legacy Hospital partners, as well as from CCMP Capital Advisors LLC, a private equity firm whose interests include a Medicare managed care plan. She is also a trustee of the Robert Wood Johnson Foundation, receiving earnings not only in that position, but $7,500 a speech for Johnson & Johnson. According to an in-depth investigative report by the Investigative Reporting Workshop and msnbc.com, and SES filings, she has earned more than $6.6 million since early 2001 for her work for major medical companies. Details of her income from the medical industry were released on July 2nd, here. “[T]he public wasn’t told that much of that corporate career was built at companies that have frequently had to defend themselves against federal investigations,” the report added. “After leaving government, DeParle accepted director positions at half a dozen companies suspected of violating the very laws and regulations she had enforced for Medicare. Those companies got into further trouble on her watch as a director.” Five of those corporations have paid a total of $566 million since 2003 to settle fraud or product liability cases, often involving tax dollars paid by Medicare. Her Czar appointment will no doubt have significant impact for the corporations she formerly served, said the report. While promoting electronic records, for instance, no one mentions that she served on the Board of Cerner Corporation, a major manufacturer of electronic medical records software, from May 2001 until the day after her White House appointment, earning at least $680,000 in compensations. Cerner has boasted that it is well-positioned to take advantage of the stimulus bill, which provided $19 billion for electronic medical records. Yet, many consumers still don’t understand what healthcare reform is mostly about, even though it was clear long ago just by examining the science and evidence. They want to believe that it’s about helping them. What do experienced medical professionals advocate for healthcare reform? To return medicine to the ethical, caring practice it once was that puts patients and people first, not profits and politics. Let’s put the patient in control, with the doctor as trusted adviser. Let’s not lose the liberty that is our right as Americans. — Dr. Donald Palmisano, M.D., July 22, 2009, National Press Club in Washington, D.C.
Our thoughts go out to our friends across the pond today and to parents with sick children there. The King's Fund and the Institute for Fiscal Studies released a new analysis of National Health Services and found healthcare spending in England has more than doubled in real terms just since 1999/2000. “Our analysis shows that the NHS is facing the most significant financial challenge in its history,” said John Appleby, chief economist at the King’s Fund. Yet, even with these realities, stories on other pages of the papers today demonstrate that government often has nonsensical spending priorities. The financial crisis is estimated by the Treasury to have dealt a permanent blow to the size of the UK economy, with a significant knock-on impact on the strength of the public finances. Given this, it is hard to see how the next spending review…could unveil further real terms increases in the NHS budget without significant reductions in spending elsewhere, or the introduction of tax-raising measures. As the Times wrote, the report found that “even under the most optimistic funding scenario, the NHS will struggle to meet people’s healthcare needs without significantly increasing its productivity after 2011.” The productivity of government-provided services, according to the Office for National Statistics, however, has fallen every year between 1997 and 2007 (by an average of 0.4%), while it has grown in the private sector by 2% per year. The King’s Fund and Institute for Fiscal Studies report said that “even if the NHS budget is not cut in real terms, future funding is likely to fall short of the population’s healthcare needs by more than £30 billion [$49.55 billion in U.S. dollars]. Is the government reading the news? The Wales Western Mail reported on a report from the charity Sands which said funding pressures and shortage of qualified maternity care providers was contributing to nearly 300 infant deaths a year in Wales. Calling the situation a “national tragedy,” Neal Long, Sands’ chief executive, said that for far too long, the rate of infant deaths and stillbirths have been ignored “and yet there is a growing body of evidence to suggest that many babies’ lives could be saved.” This situation has been well-documented for years, while worsening. The report echoed earlier work by the charity Bliss [covered here], which last year found that minimum staffing standards are still not being met in Wales and that units regularly have to close to new admissions due to lack of staff. It said that mothers and babies are being transferred between units, in some cases very long distances, which puts and intense strain on families at a critical time. Health Minister Edwina Hart was reported as responding to concerns about neonatal service by announcing a £4million [$6.61 million] cash injection over two years for neonatal transport service. With the average cost of a transport helicopter alone about $5 million, let alone transport isolettes and trained medical professionals to transport critically ill babies, the money isn’t likely to go very far. The senior nurse manager of neonatal services at Gwent Healthcare NHS Trust said that all Welsh neonatal services are still facing chronic funding problems. The all-Wales review of neonatal services, she said, had found that services were in crisis and needed £12million just to sustain them, and that there was a shortage of 170 neonatal nurses just in Wales. Nothing, however, was ever done. It’s almost inconceivable the frustration and heartache neonatal nurses and parents of critically ill newborns under NHS must feel. For years, they’ve tried to get needed medical care that all evidence shows can greatly improve babies’ survival and future health and well being, as well as to lower long-term medical expenses for the healthcare system. Meanwhile, the government continues to spend countless millions of pounds (dollars) on frivilous programs with no evidence they work in order to address a nonexistent health crisis. Calling it a “record government investment,” the government has also invested £56million [about $92.5 million U.S. dollars] over the next three years to encourage children to eat “healthily,” the news said. Remember that Scottish Diet Action Plan launched in 1996, aimed to get everyone in Scotland to eat healthier to lose weight and prevent “obesity-associated” diseases? This massive initiative included every popular healthy eating idea that’s probably ever been proposed. Hungry for Success, part of the Action Plan geared to school children was well-funded, with $126.09 million (US dollars) committed to its first three years and more for the next three. It was a flop. After a decade of intense interventions, it showed no effect on children’s’ consumption of fruits and vegetables. It also failed to have any impact on reducing children’s rates of “overweight and obesity.” The results were not at all surprising to medical professionals because the interventions were based on flawed premises on the causes of children’s diversity in sizes. Not only does the government’s own data show that none of its massive anti-childhood obesity programs are based on evidence, it also shows the money has been spent on an unsupportable crisis. When the Scottish government developed its massive Hungry for Success program to eradicate childhood obesity, there was no epidemic of childhood obesity. As we know, by reporting only the percentages of growing children crossing new arbitrary definitions for “overweight or obese,” it’s easy to create the illusion of skyrocketing obesity rates. But that doesn’t reveal the changes in actual heights and weights among children. It only gives half of the story. As readers remember, researchers at the Department of Public Health, UMDS, St. Thomas’ Campus in London, had tracked the growth of English and Scottish children from 1972 through 1994, recording actual heights and weights measured each year among representative samplings of children, ages 5 - 10, as part of the National Study of Health and Growth study. By every test of health examined, the government found children were healthier. The most notable sign that Scottish children were growing healthier and better nourished was a steady increase in their heights over the decades. Instead of an epidemic of children popping out like obesity balloons about to burst, their weights (the other part of the BMI equation, and the only one heralded) grew almost exactly matching the growth in heights. Which would you choose to spend taxpayers’ scarce healthcare money on: medical care for critically-ill babies or free vacations and fruit? The choice might be clear to us, but we’re not from the government. Last week, the Massachusetts’ state commission proposed a radical restructuring of how doctors, hospitals and healthcare providers will be paid in an effort to keep the state’s model universal coverage program from bankruptcy. Their proposals give us even more disturbing insights on what is being envisioned for all of us with health care reform. If you are older (or think you might get older sometime), have a disability or any condition that needs medical care (or think you might ever need medical care), or have a lifestyle that the government doesn’t think is healthful, you will want to know what is being planned. You’ve just been thrown under the bus. 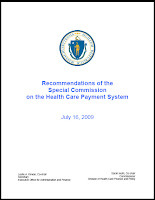 As the Special Commission on the Health Care Payment System said, healthcare spending has been rising by more than 8 percent a year in Massachusetts, faster than anywhere else in the country and at a pace that far exceeds the rise in the cost of living; and by their projections, will double by 2020. The costs of the state’s universal coverage program is threatening to bankrupt businesses and patients, they noted. The commission’s next move to try and keep universal coverage afloat are being closely followed in Washington, according to the news. What are the commission’s latest recommendations? The state commission has proposed paying providers a flat fee for each patient, forcing healthcare providers to coordinate all of the patient’s care within that budget. This payment system, called capitation, likely sent shock waves through the hearts of experienced medical professionals. That’s because capitation isn’t anything new. We’ve been down this road before, with results so devastating to the practice of medicine and welfare of patients, even while failing in its goal of lowering costs, it was largely abandoned. Members of the state commission vowed that this time capitation, which they’ve renamed a “global payment” system, will be different. Their global payment system would involve completely restructuring the healthcare system. Providers (primary-care and specialist doctors, hospitals and home health agencies) would have to form large Accountable Care Organizations, with the ACOs to receive the annual fee-per-patient from the state to divide among them all. This effectively eliminates private, independent doctor practices. The commission’s scheme also establishes another new authority, an Executive Branch agency, that will decide how much money will be allotted for the care of each type of patient. [See "Comparative effective research-what it means for us" to learn how the healthcare reform movement is deciding how resources and care will be allocated (i.e. rationed), and “Vision for our healthcare” for what the federal government is already doing.] This new government agency will also be charged with robust monitoring and oversight of compliance. Despite these far-reaching proposals, the commission acknowledged that there is scant evidence that P4P, the medical home model or global payments have positive effects, improve quality of patient care or patient outcomes, or that they reduce healthcare costs. But correlations suggest that they might work, they wrote. “Medical homes are generally in an early stage of development,” according to their supplemental documentation, so “evidence of their effectiveness as currently implemented is limited.” There is also limited evidence for making evidence-based spending decisions, they wrote, with the largest and longest example in the country being the Oregon Health Plan which famously took on the task of prioritizing state expenditures based on comparative effectiveness analysis. [Covered here and here]. 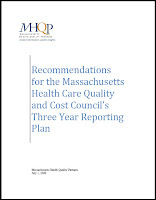 As outlined in the July 1st report, Recommendations for the Massachusetts Health Care Quality and Cost Council’s Three Year Reporting Plan,the state mandates not only integrated electronic medical records, but also wants to increase the number of reportable conditions each year. “Patients must be attributed to physicians who will be held accountable for the quality and cost of care provided to them,” they wrote. And accountable to the State. Starting next year, doctors and hospitals must report patients with hip and knee replacement, lower back pain, diabetes, cardiovascular disease, respiratory disease; adherence to screening tests including mammograms and colonoscopies; and prenatal care. In 2011, reported conditions will include depression, hypertension, kidney disease, pediatric conditions, GI disorders, urinary tract infections, female genital disorders and contraception use. In 2012, the state recommends adding home health care, hospice and dental to its reporting requirements; along with conditions such as skin disorders, influenza, glaucoma and cancer treatment. For 2013 and beyond, they want the conditions reported to the state to include connective tissue disorders such as systemic lupus, nutritional disorders, thyroid disease, cataracts, headaches and more; along with adherence to obesity prevention and tobacco cessation interventions. Healthcare reform advocates believe you want the state to know this information about you, and to monitor you and their doctors’ compliance with interventions it determines best — interventions developed by stakeholders, interventions that are not based on sound scientific evidence. Is that really what you want? For nonmedical or younger readers who may be unfamiliar with capitation and what this new payment proposal means, here is a glimpse of what doctors were talking about in the medical literature when it was first widely promoted when managed care was failing to reduce costs. It may help you better understand the news spin this past week. It may also help to better understand the concerns that medical professionals have with all of this. It's long but more important to know than ever. As Dr. Patrick C. Alguire, M.D., Director of Education and Career Development with the American College of Physicians explained, capitation payments are part of the efforts of some managed care plans to control costs. Capitation is a fixed amount of money per patient paid in advance for the delivery of health care services for a certain period of time. Capitation includes a list of specific interventions the provider must provide, with most including specific preventive screenings, diagnostic services and treatments; lab tests; health education and counseling and medications. Healthcare providers risk losing money if they provide care that goes over their budget, or if they make referrals to specialists or for expensive diagnostic tests or treatments; or if they fail to comply with the care mandates; while they can keep more money for themselves if they spend less. You can guess the end results of this idea. 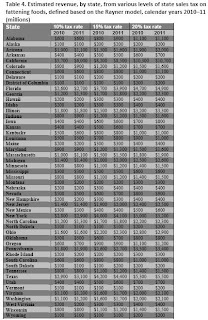 If you are unlucky enough to have been born with any condition that requires ongoing care or is expensive to treat — or have a condition like normal aging, or obesity that the government has mandated must receive screening tests, labwork and interventions — fewer doctors will be able to afford to care for you and risk you costing them money. Nor will they want to bring more government oversight and scrutiny onto their practices. And if you develop a symptom that could be serious, doctors will have a financial incentive to downplay it and not treat it aggressively in order to keep more state money for this year. Plus, how quickly will you be labeled as a noncompliant patient and be unable to find a doctor, if you don’t want to undergo the screenings, labwork and interventions, including diets, counseling and medications, that the government mandates? During the 1990s, the medical literature was filled with ethical discussions and loud protests by American medical professionals who were experiencing capitation as part of healthcare reform and managed care. Similar discussions were taking place among Canadian doctors when capitation was proposed in 1997 as part of Ontario’s Health Services Restructuring Commission’s reform recommendations for its struggling healthcare system. Resistance was so intense during the 1990s among doctors and consumers, that it may help all of us to remember some of those ethical concerns. It’s also helpful to remember that, after decades, evidence of benefits of capitation and managed care remains lacking. The United States has been blessed with abundant resources over the last half of the 20th century. While the healthcare system has meant limited access and poorer health outcomes for some, wrote Dr. Charles K. Francis, M.D., “for the majority of the population, however, health care in the U.S. has been characterized by an abundance of technology, physician manpower, pharmaceutical advances and an environment of nearly unlimited support for research and discovery.” The perception sold to the public was that the health care system was “guilty of unbridled spending and profligate resource allocation.” This effectively built support for “healthcare reform” and the advent of managed care. Arguments that managed care helps in meeting social needs because resulting health care cost savings may be transferred to other socially responsible functions or programs are, at a minimum, disingenuous. Experience has shown that much of the early benefit of the new health care paradigm accrued to share holders and company executives rather than the general public. Since managed care has become the dominant health care delivery system in the United States, the number of uninsured persons in the population has increased… Real progress toward removing racial and ethnic disparities in access to health care remains a largely unfulfilled promise. Numerous examples of racial disparities in access to care and health outcomes have been described. For example, in a study of Medicare recipients [covered under government managed care] the rate of mammography use was lower in black women compared to white women and lower in less affluent women than in more affluent women regardless of race… Inequalities in health status based on race and ethnicity, as well as socioeconomic status, attest to the inescapable reality of racism in America, and especially its role in access to health care and the delivery of medical services. Dr. Francis went on to describe numerous studies showing disparities in health outcomes among minorities and socially disadvantaged, as JFS has also examined, regardless of whether or not they had health insurance or government provided coverage and access to healthcare. Managed care and healthcare reform, while seemingly to equalize access to healthcare to disadvantaged, marginalized and discriminated groups, doesn’t address the core prejudices and social-economics behind health disparities. And the ethical issues it brings to the practice of medicine doesn't make it a more ethical way to deliver healthcare. Naturally, people are nervous about the effects of profit motives on the quality of their medical care. But when medical professionals strongly hold the traditional medical ethics that place their duties first and foremost to the best interests of the patients in their care, patients can trust their doctors to make ethical decisions on their behalf. But beliefs that managed care would reduce profits for those providing medical care served to shift them to insurance companies. Third-party payers and insurance companies have different objectives from those of doctors and patients. Clearly, the potential for conflicts of interest in patient care exists in all forms of medical care systems, wrote Dr. Norman G. Levinsky, M.D., in a 1995 issue of The American Journal of Managed Care. In traditional fee-for-service practice, the possibility of personal economic gain may influence a doctor, consciously or subconsciously, to deliver excessive medical services. But without an economic incentive, he pointed out, salaried physicians may also provide less-than-optimal personal effort and poorer care. “Obviously, economic factors also influence the schedule of the fee-for-service practitioner,” he wrote, but with fee-for-service, “ultimately, the balance between income and practice standards is set by the physician alone.” If a doctor chooses to spend more time with a patient, as is fundamental for creating a bond with his patient and treat them as a whole person, he could. Managed care, however, adds a third master. Doctors are expected to serve the financial goals of managed care plans, in addition to caring for the medical needs of their patients, he explained. “Pressures to decrease expenditures in the care of individual patients…now are focused sharply by specific mandates from managers of health maintenance organizations (HMOs) to limit expenditures.” In most plans, a primary care physician is charged with serving as a gatekeeper to limit access of patients to diagnostic studies, therapeutic alternatives, specialists and hospitalization. For patients, it means that their doctor is less free to take time with them, do the tests and provide the care they might feel best for them. “Working on schedules set by management, primary care physicians also may be required to reduce their own services to patients to suboptimal levels, especially that most precious component of primary medical care, their own time.” This is a little understood difference between doctors paid by the services they provide versus capitated managed care. Managed care has changed the mindset of healthcare from what’s best for the patient to what’s best for the bottom line. “From the perspective of professional ethics, two key features of managed care that are of great concern are incentives or pressures on physicians to limit clinical services and mechanisms by which nonprofessionals can control physician behavior,” wrote Dr. Levinsky. “In fee-for-service practice, physicians struggle only with their own consciences. In managed care entities, managers can impose their standards on physicians.” And, as is slowly becoming more realized today, the role of many clinical practice mandates isn’t as much to save costs as it is to make money for the third-party payer, such as in pharmacy benefit management schemes. Like last week’s Massachusetts’ proposals, under Canada’s capitation, doctors were also required to join provider networks to offer predefined services and each patient had to sign a contract agreeing to obtain services only from that network. “From physicians’ perspective, signing contracts and restricting patient choice recasts the doctor-patient relationship from a personal, fiduciary relationship to a legalistic, quasibusiness affiliation,” wrote Dr. Mulligan. These contracts penalized doctors when patients went outside their network, discouraged doctors from working in rural areas where income potential and ability to pool risk was reduced, and created an administrative and financial burden. Just developing, monitoring and enforcing the contracts drained resources from medical care. “In Britain, introduction of a ‘contract culture’ (under the failed internal market reforms) led to a marked increase in administrative costs,” she wrote. By transferring risk to doctors, incentives are also created for cream-skimming and taking relative healthy, low-cost patients while discouraging enrollment of high-cost, high-maintenance patients, she said. Despite regulations against refusing care or enrollment on the basis of health status, “evidence shows that capitated organizations can cream-skim in subtle ways to circumvent regulations that prohibit them from denying membership on the basis of health status. These strategies include deliberately establishing practices in areas with healthy populations and providing poor service to high-risk patients, thereby encouraging them to withdraw from the roster.” Because of concerns about cream-skimming by Ontario’s capitation-paid health services organizations, the government decided not to expand this program, she said. There is no such thing as kinder, gentler capitation, said Dr. Mulligan. “If a patient's employer or health insurer walked into a physician's office while the patient was waiting to be seen and offered the physician money to withhold services from the patient, the physician would probably give a frosty refusal,” wrote Dr. Harry P. Selker, M.D., in a 1996 issue of Annals of Internal Medicine. “To do otherwise would be contrary to the physician's role as trusted advocate for the patient's best interests. And yet, this conflict of interest is central to capitated care,” he said. Unfortunately, many persons now believe in or promulgate the fallacy of "black or white:" If the existing system, which gives incentives for excessive treatment, is bad, then its opposite, a system that provides incentives for giving less treatment by putting the provider at financial risk for the costs of care, must be good. However, a health payment system in which incentives are based solely on this premise is only "managed cost," not "managed care." This abuses our patients’ trust and that of the public, he explained. : “One wonders if this trust would survive a local newspaper headline such as ‘Physicians Accept Money To Deny Their Patients Medical Care’ (or something more colorful). And how would we feel about our own roles as physicians when asked about his headline by our own patients?” That front page test helps us to know if we’re doing the right thing and is perhaps the most telling of the ethics of capitation. It rests on the narrow model that assumes financial incentives alone shape human behavior. Business philosophy assumes that capitation will lead physicians to alter their routine office and treatment patterns in a way that will tend to be consistent with their economic incentives... The fact that managed care companies and capitated practitioners earn profits by withholding services, or by substituting less expensive for more costly care, raises suspicions about their motives. This is a debate about trust. One’s position probably depends on one’s belief that companies, managers, and clinicians, operating under capitation limits and profit incentives in managed care, will manage in one’s best interests. When we consider medicine as “commodity versus service,” we see a change in vocabulary. "Commodity, customer, provider, vendor" all demean the professional aspect of our calling. 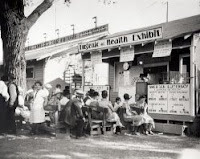 “The current trend toward the invasion of commerce into medical care, an arena formerly under the exclusive purview of physicians, is seen by the authors as an epic clash of cultures between commercial and professional traditions in the United States. The fundamental act of professional medicine is the assumption of responsibility for the patient’s welfare. The essential image of the professional is that of a practitioner who values the patient’s welfare above his or her own and provides service even at a fiscal loss and despite physical discomfort or inconvenience. 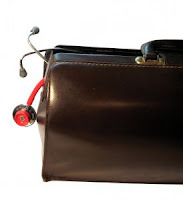 There is no outside invested capital seeking returns from the physician’s work. Ethical concerns over managed care during the 1990s sparked a wave of government regulations to protect patients. In 1996 alone, one thousand pieces of legislation to regulate or weaken HMOs were introduced in state legislatures and 56 laws were passed in 35 states. Around 15 years ago, most of the medical discussions over the problems doctors fought with managed care and capitation repeated a theme that is strikingly more absent today. That theme was the long-standing tenets of medical ethics. At its deepest soul, the practice of medicine has been founded on the moral commitment of every medical professional to heal and protect patients, especially the most vulnerable. Medical professionals have been guided by codes of ethics for millennia. Chief among the moral obligations under the Hippocratic tradition of medicine calls for doctors and medical professionals to do everything they can to help the patients under their care and that they are duty bound to look out for the best interests of their patients. The Academy further concludes that by maintaining the four tenets of non-malfeasance, beneficence, autonomy, and distributive justice as the foundation on which physicians function, physicians hold to an honorable medical profession that will not jeopardize the trust and confidence of the public who are served. Managed care can compromise the quality and integrity of the patient-physician relationship and reduce the quality of care received by patients. In particular, by creating conflicting loyalties for the physician, some of the techniques of managed care can undermine the physician's fundamental obligation to serve as patient advocate. Moreover, in their zeal to control utilization, managed care plans may withhold appropriate diagnostic procedures or treatment modalities for patients. If physicians no longer hold their patients’ best interests foremost and patients can no longer trust them to care for them, patients are left more vulnerable than ever and without true advocacy. Managed care plans are increasingly for-profit companies, wrote the CEJA, with cost considerations determining the guidelines physicians must follow and what services should be offered. But rather than their primary responsibility to their patients, under managed care doctors are put into a compromising and “morally dubious” position of being gatekeepers to reduce costs. They must now become engage in “bedside rationing” and decide whether a patient will be granted further access to the health care system, including referrals to specialists and diagnostic tests. In 1997, the CEJA issued a separate document, “The Ethical Implications of Capitation,” which noted that doctors practicing under capitation “typically experience significant pressure to stay within an allotted budget from colleagues who share the resource pool and from insurance companies, employers, and other third-party payers.” Regardless of whether it changes physicians’ practice of medicine to be cost-conscious, the Council stated, “capitation successfully shifts the mentality of practicing physicians” to make decisions based on cost. More so, it alters the role of the doctor, it stated. Medicine has long held that the primary obligation of physicians is to advocate for the interests of each individual patient. In a capitated environment, however, patients covered by the same pool have overlapping interests…As physicians under capitation assume many of the roles traditionally held by insurers, however, these decisions could be brought to the bedside…It is difficult for payment rates based on either purely economic or legal premises to reflect the appropriate goals and aims of the profession, including the provision of necessary care and the preservation of ethical practice. First, [under capitation] physicians have an incentive to cut corners in their patient care, by temporizing too long, eschewing extra diagnostic tests, or refraining from an expensive referral…Second, even in the absence of actual patient harm, the incentives may erode patient trust as patients wonder whether they are receiving all necessary care or are being denied care because of the physicians' pecuniary concerns. It is true that financial conflicts are inherent in the practice of medicine, regardless of the system of delivery. But it’s also true that physicians have generally been able to maintain their duty to patient welfare despite those conflicts. However, incentives to limit care as in managed care’s capitation, are more ethically problematic than incentives to provide care, the CEJA said. First, financial incentives to limit care exploit the financial motive of physicians, making the physician's financial self-interest indispensable for the success of the managed care organization. Second, financial incentives to limit care are less likely than financial incentives created by fee- for-service to coincide with patients' interests, because patients generally prefer the risk of too much care to the risk of too little care. Third, the effects of incentives to limit care are less likely to be noticed by patients. When a physician recommends a course of action under fee-for-service reimbursement, the patient can seek a second opinion. However, when a physician does not offer an intervention under managed care, the patient may have no idea that a treatment option was withheld and therefore not recognize the need for a second opinion. … [I]t is important to consider what is at stake. The foundation of the patient-physician relationship is the trust that physicians are dedicated first and foremost to serving the needs of their patients. In the Oath of Hippocrates, trust is a central element in almost all of the ethical obligations of physicians: physicians must keep patients' private information confidential, avoid mischief and sexual misconduct, and give no harmful or death-causing agent. Patients can expect that physicians will come to their aid even if it means putting the physician's own health at risk, and they can trust that physicians will do everything in their power to help their patients. It is this trust which enables patients to communicate private information and to place their health, and indeed their lives, in the hands of their physicians. Without trust, the success of the healing process would be seriously diminished. Healthcare, managed by the government and other third-party payers, along with political and economic interests, has served to alter the very meaning of medical ethics for some. Over the past fifteen years, medical ethics has steadily become distorted into something disturbingly different. “The physician is no longer the independent decision maker guided solely by a professional code, a paradigm that has dominated theories of medical ethics,” wrote doctors Katherine Swartz, Ph.D., and Troyen A. Brennan, M.D., JD, MPH in 1996. The work of Dr. Edmund Pellegrino, M.D., has been mentioned several times at JFS, along with some of the ethical discussions from the President’s Council on Bioethics. As regular readers know, Dr. Pellegrino, Professor Emeritus of Medicine and Medical Ethics and Adjunct Professor of Philosophy and Director of the Center for Bioethics at Georgetown University, has been widely respected and trusted in the medical community for his lifelong devotion to promoting ethics in the practice of medicine and the importance of intellectual honesty and fidelity to patients. No one in our lifetime has equaled his contribution to the bioethics field and his appointment as chair of the President’s Council on Bioethics was widely supported. For medical providers, “there is no absolute moral principle except the injunction to act in the patient’s best interest,” he wrote. In 1997, he spoke to doctors at a medical ethics conference on the ethical challenges in the era of managed care, sharing a troubling observation of the changing face of medical ethics today — one that was departing from the Hippocratic oath of a healing relationship between the doctor and patient that puts the best interests of their patients first. In describing what he saw evolving in medicine, Dr. Pellegrino warned that medicine was increasingly being used for purposes other than the good of the sick, and was failing to be stewards of sound medical knowledge. In his famous 1997 Annals of Internal Medicine editorial, “The Nazi Doctors and Nuremberg: Some moral lessons revisited,” he cautioned doctors about the fragility of medical ethics and how easily they can be led to do the most unthinkable things, while believing themselves to be ethical and reasoned. Even today, he warned, the moral lessons of the Nuremberg Trials have not been learned and it is wrong to believe such atrocities could never happen again. In an article entitled “Guarding the Integrity of Medical Ethics-Some Lessons from Soviet Russia,” he shared two lessons from the subversion of medical ethics he saw: corruption will afflict any health system not designed with care of the patient as the its primary driving force; and medical ethics must be independent of political exigency. "[A] morally responsive profession is an indispensable safeguard for the sick against the statistical morality of utilitarian politics, even in democracies,” he wrote. The Nazi doctors justified their actions by what they believed to be moral reasons and we see the same premises being repeated today, he cautioned: “that law takes precedence over ethics, that the good of the many is more important than the good of the few, that national emergencies supersede ethics, and that some persons can lose their claim to humanity.” Moral lessons must be repeatedly relearned, he said. In the “new medical ethics” that came with managed care, discussed here, quality of care was redefined to mean the greatest good for the greatest number within the collective the doctor belonged. In just a little over a decade, medical ethics has been turned upside down. Every day brings us closer to precisely what he warned against. It should disturb each one of us to our very souls, that Dr. Pellegrino’s warnings about a “new medical ethic” are playing out so clearly. 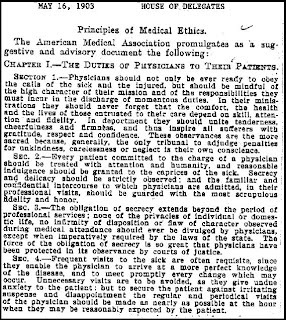 Physicians should not only be ever ready to obey the calls of the sick and the injured, but should be mindful of the high character of their mission and of the responsibilities they must incur in the discharge of momentous duties. In their ministrations, they should never forget that the comfort, the health and the lives of those entrusted to their care depend on skill, attention and fidelity. In deportment, they should unite tenderness, cheerfulness and firmness, and thus inspire all sufferers with gratitude, respect and confidence. These observances are the more sacred because, generally, the only tribunal to adjudge penalties for unkindness, carelessness or neglect is their own conscience. It is incompatible with honorable standing in the profession to resort to public advertisements or private cards inviting the attention of persons affected with particular diseases; to promise radical cures; to publish cases or operations in the daily print [media], or to suffer such publication to be made; to invite laymen (other than relatives who may desire to be at hand) to be present at operations; to boast of cures and remedies; to adduce certificates of skill and success, or to employ any of the other methods of charlatans. It is the duty of physicians, who are frequently witnesses to the great wrongs committed by charlatans, and of the injury to health and even destruction of life caused by the use of their treatments, to enlighten the public on these subjects, and to make known the injuries sustained by the unwary from the devices and pretension of artful imposters…. These are not the new medical ethics. Compare those long-standing medical ethics with today’s principles. More importantly, compare them with proposals under healthcare reform at the beginning of this article. Will people figure out what’s going on? More than ever, our society needs doctors and medical professionals, who pledge some Hippocratic oath of medical ethics, to be guiding us on ethical issues that affect medical care — not lawyers, politicians or corporations. The President’s Council on Bioethics, chaired first by Dr. Leon Kass, M.D., Ph.D., and then Dr. Pellegrino, had been tasked with advising the government and our society on the ethical issues related to advances in biomedical science and technology. It has issued some of the most thought-provoking ethical discussions in modern medicine, and that I’ve ever read as a medical professional. Over the years, it’s given me a deeper, richer understanding of the ethics in medicine and public policies and altered what I thought I believed to be true more than once. Take a look at a few of their recent papers, such as one on the ethics of genetic testing and public policy and one on the history and ethical issues surrounding newborn screening, covered here. Others that are especially relevant to today’s considerations of healthcare reform included an unsettling discussion on medical care and the common good which examined problems in the American healthcare system, of healthcare access and the uninsured, healthcare costs, quality of healthcare, and whether healthcare should be a commodity or a right; and another on the ethical questions in reforming medical care. Reading them will leave you feeling mad to inspired. We won’t agree with each viewpoint, nor should any of us. But most importantly, they force us to think about all sides of an issue, take a hard look and think through the consequences of decisions, and consider things we would never have thought about before. Stakeholders don’t want us to think. Encouraging society, the public and medical professionals to educate themselves, understand history and think about things that might feel uncomfortable, before we act to do things that will change the future for each one of us and for our children, is a threat to ideologies and agendas. Last month, with one day’s notice and shortly before they were to issue a number of new papers, the President’s Council on Bioethics was told by the White House that their services were no longer needed. Instead, the White House press officer said the President plans to appoint a new bioethics commission “with a new mandate that offers practical policy options.” Robin Alta Charo, JD, a law professor and member of Obama’s transition team, was quoted saying that a new commission should focus on helping the government form ethically defensible policy. Just as sound science doesn’t change with the political wind, ethics doesn’t either. Medical ethics doesn’t work backwards or reinvent itself to create an argument in support of a governmental agenda. We are entering a new ethics, as Dr. Pellegrino warned.